Scholarship and Awards Day at Belmont University. The Belmont University Scholarship and Awards Day is a special day honoring faculty and students who have achieved success in their educational endeavors. The 2019 ceremony, held on April 10, began with welcoming remarks from Belmont University President Dr. Bob Fisher. After speaking to the importance of the day and thanking family members for attending, Provost Dr. Thomas Burns took over and honored students who made the dean’s list for fall 2018 and retired faculty. Before the awards were presented, Dr. Vaughn May, professor of political science and recipient of the 2017-2018 Chaney Distinguished Professor Award, gave the Honors Address speaking to the intellectual curiosity of students at Belmont. He also commented on the community fostered by faculty, staff and students at Belmont. “We are all blessed to be a part of this community,” said May. Dr. Jimmy Davis receives Chaney Distinguished Professor Award from Provost Burns. 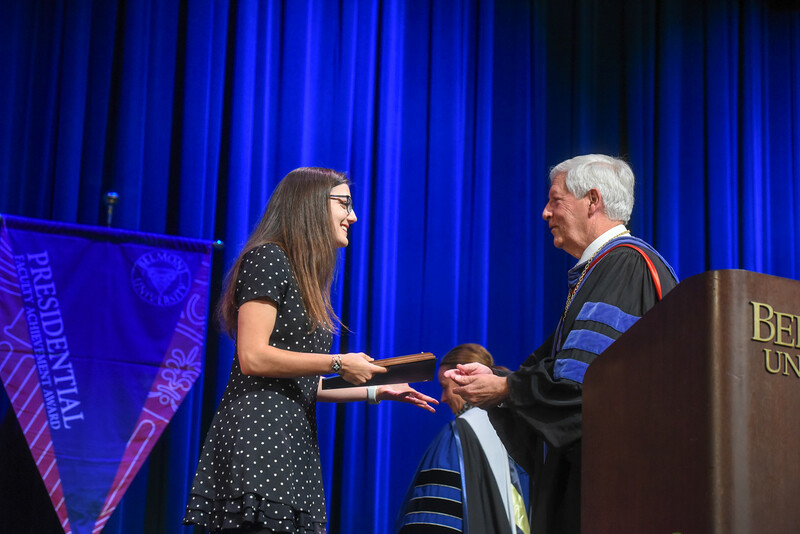 Amy Hodges-Hamilton (English) wins Presidential Award at Scholarship and Awards Day at Belmont University in Nashville, Tennessee, April 10, 2019. The Williams-Murray First Year Writing Award: Anna Thompson and Mary Frances White. The Alfred Leland Crabb Award, Creative: Sydney Queen. The Alfred Leland Crabb Award, Research/Analytical: Sophie Lasher. The Stacy Awalt Writing Award: Peyton Harrington. The Annette Sisson First Year Seminar Award: Caitlyn Kimiko Ferral. The Lumos Travel Award: Christopher Hansen, traveling to Haiti, Rebekah McKerley, traveling to Uganda, Jessica Molloy, traveling to the Dominican Republic, Kathryn Wurm, traveling to India, Jordan Dunn, traveling to Nepal. The Dr. Fannie Hewlett Award, Undergraduate: LeAndrea Wallace. The Dr. Fannie Hewlett Award, Graduate: Caleb Darensbourg. The University Hale Leadership Award, First Year: Zachary William Kurtz, history major. The University Hale Leadership Award, Second Year: Haleema Shamsuddin, Honors, biochemistry and molecular biology major. The University Hale Leadership Award, Third Year: Madalyn Nicole Vanarthos, music therapy major. The University Hale Leadership Award, Fourth Year: Mary Barber, Presidential Scholar, chemistry major. The Christian Scholarship Award: Dr. Bonnie Smith Whitehouse, Director of the Honors Program and professor of English. The Leadership in Christian Service Award: Dr. Mona Ivey-Soto, assistant professor of education. The Scholarship Award: Dr. Mark Schenkel, professor of entrepreneurship. Visit the Belmont photo gallery to view more images from today’s event.